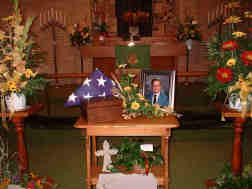 I gave this eulogy at my brother's funeral in Clear Lake, South Dakota, on Saturday, 30 August 2003. My first memory of Kenny isn't actually about Kenny. I don't remember Mom bringing him home from the hospital. I don't remember him as a little baby. But I do remember Dad mopping the kitchen floor while Mom was gone. He let us kids slide across the wet linoleum, something Mom never allowed. Born July 2, 1955, Kenny grew up in the Hidewood Valley and graduated from Clear Lake High School. He bought a new '75 Chevy Nova, reigned as local foosball champion, and worked at the Gopher Sign Company. 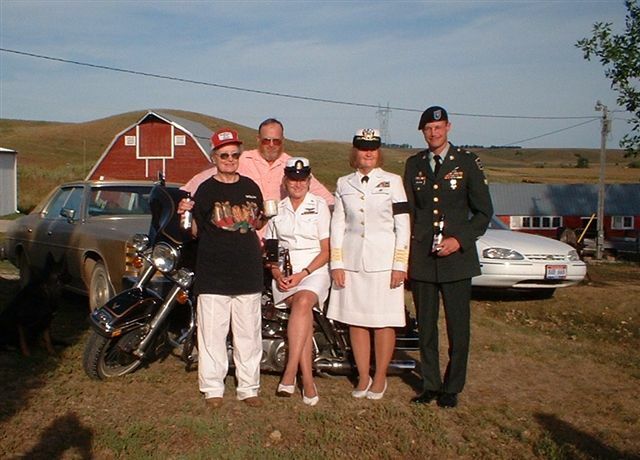 He earned a commission as a second lieutenant in the South Dakota National Guard and planned to celebrate his 25th birthday with a pig roast and keg of beer. Life was good in 1980. But that summer his life changed. For the rest of his life Kenny took medicine with such serious side effects the treatment seemed as bad as the disease. As he became sicker, he had to give up his job and his Army commission. After nine years the doctors scheduled a liver transplant as a last resort. Kenny received his new liver on September 12, 1989, in Portland, Oregon. Although the transplant went well, the anti-rejection drugs left him without an immune system, and he almost died twice from yeast infection. He spent a year in the hospital, with six months of that in intensive care, followed by a year in a nursing home before he could return to South Dakota. Mom stayed with him that entire two years. Dad and Keith kept the home fires burning, and they alternated visits to Portland. Kayo flew up from San Diego whenever Mom needed her. Ron was with the Army in Korea and I was with the Navy on Guam. Once, we took emergency leave and flew to Portland. Months later, Kenny and I discussed that November visit. He was surprised to learn we'd been there. When I told him we'd brought our dress uniforms, he chuckled. He knew I meant we'd come prepared for a funeral. Today, Ron and Kayo and I are wearing the uniforms we didn't have to wear fourteen years ago. Kenny celebrated his 35th birthday in the Portland hospital. I wrote him a letter saying I looked forward to waltzing with him again. A year later he came home, just in time for the all-school reunion dance. He asked me to waltz, and as we slowly moved across the floor, I realized he'd saved his first dance for me. As his strength returned, Kenny rebuilt his life. He went back to school at age 40, earned an associate's degree to become a construction electrician, and operated his KD General Repair business. And he fell in love. During the 1980s he'd avoided romance because he didn't want anyone to be saddled with a dying man. But with a new life in the 1990s, when he found Marjean, he married her. Marjean brought Kenny much-deserved happiness these past five years. We were glad he had someone to love and he no longer lived alone. Kenny enjoyed being a dad to Ross, and spending time with Kari's and Gina's families. Although it's hard to say farewell, we can't be sad that Kenny is in heaven or that he was spared future suffering. His many health problems would only have gotten worse. The blood clot gave him a painless death, he was in the Portland hospital where he always felt comfortable and cared for, and he had Marjean at his side. God was merciful. Of all the people who have been important in Kenny's life, and there are many, especially here in Clear Lake, I'd like to acknowledge one special person--Dr. Pinson, the transplant surgeon who replaced Kenny's liver and kept him alive those first critical months. We are forever grateful to him. His advice that Kenny should limit alcohol consumption to "maybe a beer at Thanksgiving" became a family joke. Kenny loved that comment, and usually had a reason for the rare occasions he tasted wine or beer. Earlier this summer while I was home on leave, Kenny and Marjean came in the house for a cold beer. I teased, "Kenny, it isn't Thanksgiving." He responded, "I'm thankful the weeds are pulled." And I'm thankful we had Kenny in our lives for 48 years.